Regular readers know that I'm a huge proponent of solo role-playing games for those days when you can't get a group together. 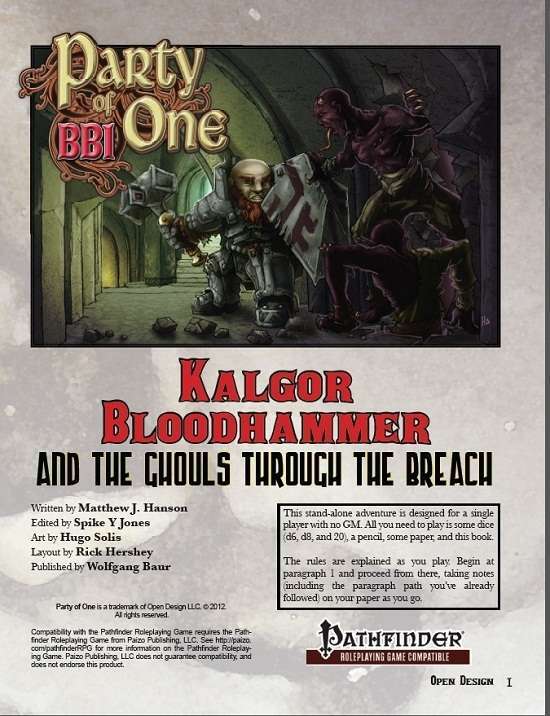 While this is generally the domain of Tunnels & Trolls, Chronicles of Arax and Fighting Fantasy, Open Design has stepped up to create a series of solo adventures for Pathfinder; the first being Kalgor Bloodhammer and the Ghouls Through the Breach. Kalgor is the first in a series of solitaire games called Party of 1, which thrusts you into the shows of a pre-determined character, in this case it's Kalgor the dwarf. In the adventure you will lead Kalgor against the ravenous undead in an effort to protect his home from invasion. All the rules are presented at the beginning of the book so you don't need to own the Pathfinder rules to play. I'll be picking this up and reviewing it next week. Until then, you can download Kalgor for a very cheap price. This is very intriguing. Years ago I tried to right a solo for DnD3.5 but found it very difficult to do. I assumed that the lack of solos around was partly because the rules didn't adapt well to solos, but also I suspect that there's still a lot of snobbery about solo texts being for "intro"-games only. I love playing solo games - I blame Fighting fantasy, T&T and red box Basic. ;) I may have to take a good look at this product. :) Thanks for pointing it out! You're right with the "intro-only" mentality with the bigger games. While it's a nice idea to get people familiar with the rules, quite a few more systems could have solo adventures if they clip their rules to the bare basics.